Scrangie: Scrangie by Rescue Beauty Lounge now available for pre-order! Scrangie by Rescue Beauty Lounge now available for pre-order! 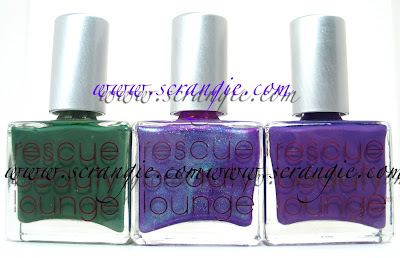 Scrangie by Rescue Beauty Lounge is now available for pre-order on RescueBeauty.com! Click here to pre-order Scrangie! All three colors in this collection are limited edition, so get them while you can! I'm so proud of my color. I think you'll love it as much as I do! Just placed my order. I've been wearing shimmery blues and blurples and almost nothing else all summer. Your color seriously looks like my dream come true. Thank you! Just got it!!! CANNOT WAIT!!!! I ordered mine too...all 3!!! Awesome!! I am so looking forward to wearing them and want to thank you for such a cool colour combination. Purple and green have always been my faves too. You rock, Scrangie! It looks gorgeous, Scrangie! I'm really excited about it, and for you! I KNOW I will love it! It reminds me so much of Fyrinnae's Faerie Glamour. Ooo those are pretty, especially the one in the middle! Oh great, thanks for letting us know! I really want Scrangie! It's pretty, nice job! Your color is GORGEOUS, I'm super curious as to how it would look with the matte topcoat. Have you had a chance to test run the topcoat (w/ or w/o scrangie)? How does it compare to the essie? Thanks for letting us know! I just ordered "Scrangie" it looks beautiful! it looks amazing! how great it is to create your own dream color! i second what anonymous said. can we order internationally? Oh I want you color so bad! Arg...I wish I wasn't so freaking broke right now! lol. Wow...they are incredible colors!! Pity I'm so far away (Brazil) and so broke now! Anyways I love yr Blol that's why I decided following deliberatedly.It's great inspiration for me. Honey kiss. It shall be mine! I placed my order yesterday as soon as I got the email from RBL. Can't wait to have them all! I have a suggestion: Wouldnt it be cool for one of the nail polish bloggers to do some sort of monthly or quarterly calendar of future release dates for that month. I know alot of collections are releasing something in August and I just thought a calendar whould be a sure fire way not to miss something. Just placed my order as well - most expensive polish I've ever owned ($26.50 with shipping) but I am excited to use it soon. Great collection of colors. Mine are ordered and on their lovely way. I didn't order the topcoat since I haven't heard anything about it. Besides Essie's looks pretty damn good and it's much cheaper. Yes you can order internationally. I'm from Australia and put my order for all three. Can't wait! Scrangie yours is just so beautiful! Hi from tarotbydiana. I finally have a google account for posting, hence the polish related name change. I am in love with the color you co-created. It's beautiful! Congratulations to you! Scrangie!! Can we expect swatches soon? I am most definitely getting your color because it's shimmery goodness, but the other cremes, although lovely, I'm hesitant about. Could you kindly do comparisons? I'd be very glad!! If I could afford $18 for 1 polish this would be the one!!!!! All 3 of my favorite colors in one bottle! I think your polish is SUCH a gorgeous color! Thanks for working so hard to create something unique and beautiful. Does anyone know what the costs are for international postage(EU)? What was that they said in Pokemon? Gotta get 'em all? Scrangie , 27.50 ( Since they are charging 8.50 for shipping a single polish ) Isn't that a little over board? If you walked into lets say a cvs / sallys or something and this polish was there for 27.50 do you think the polish justifies the price? It certainly does not on the other 2 colors. I think postage overseas is a flat rate of....$35 or $36!!! I am waiting to hear back from them to see if there is a lower rate. Kind of makes buying one or two almost blasphemous it's so expensive. I received mine yesterday and OMG is "Scrangie" GORGEOUS!!!!! I just can't stop looking at.........so beautiful & totally unique! Thanks so much for creating this. I'm going to order another bottle or 2 for my stash.